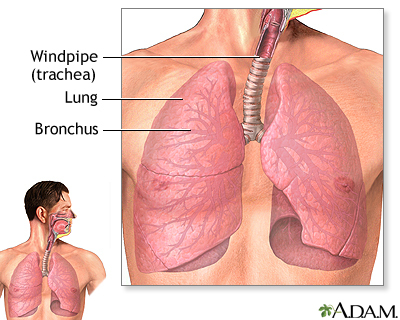 The major passages and structures of the lower respiratory tract include the windpipe (trachea) and within the lungs, the bronchi, bronchioles, and alveoli. Deep in the lungs, each bronchus divides into secondary and tertiary bronchi, which continue to branch to smaller airways called the bronchioles. The bronchioles end in air sacs called the alveoli. Alveoli are bunched together into clusters to form alveolar sacs. Gas exchange occurs on the surface of each alveolus by a network of capillaries carrying blood that has come through veins from other parts of the body.